Chicco Bravo Trio Travel System is one of the best-selling car seat & stroller combos in the US. Are you wondering what is so special about it or whether this travel system will meet your needs? Read my review and find out if Chicco Bravo Trio is right for you and your baby. 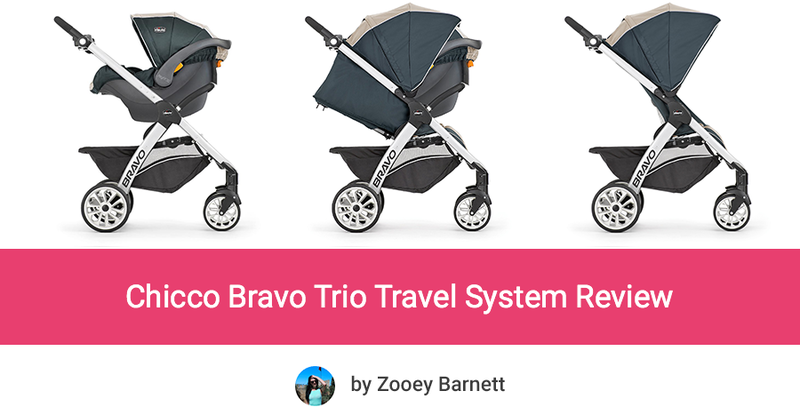 When you check Chicco Bravo Trio in online stores and read what other parents think about it, you will quickly realize that this is one of the best travel systems available on the market. And that’s not surprising when you consider how many useful features it has and how well-made it is. When you choose Chicco Bravo Trio Travel System you get really good quality for an affordable price. No wonder this travel system is so popular! What is included in set? What other parents think about Chicco Bravo Trio Travel System? If you’re here you are probably considering buying this stroller and you are looking for Chicco Bravo Trio Travel System reviews to find out what other parents think about it. Here I present you the most important information about this stroller, based on my experience and hundreds reviews written by other parents. 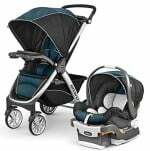 Chicco Bravo Trio Travel System includes Chicco Bravo Stroller, KeyFit 30 Infant Car Seat and car seat base, parent tray with cup holders. We can use this stroller from infancy to toddlerhood. The infant car seat can be attached when the toddler seat is still on or we can remove the seat first and transform our Bravo into car seat frame. And when the baby gets older and sits up straight we can use Bravo with the regular seat. Travel systems, like this one, have two main advantages. Firstly, they reduce amount of baby gear that parents have to buy, therefore they allow to save space in home. Secondly, they usually are pocket-friendly. We can buy a set of matching toddler stroller and infant car seat, both high-quality, reliable and at a good price! What’s really great about the Chicco Bravo Stroller is that it comes with free car seat adapter that accepts not only KeyFit 30 (included in the set), but also other KeyFit and Fit2 infant car seats. You can use Chicco Bravo Trio from birth with attached infant car seat. KeyFit 30 can be attached to the stroller frame or stroller seat. 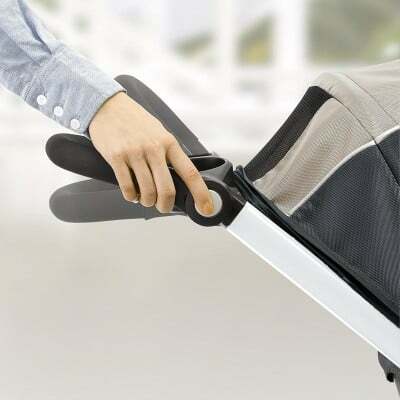 You can turn the stroller into infant car seat carrier for newborn baby, thanks to removable seat. You can push only the lightweight frame with the infant car seat, you just need to detach the stroller seat, click in the KeyFit 30 Infant Car Seat and you are ready to go! However, you don’t have to remove the toddler seat every time you want to use the stroller with car seat! 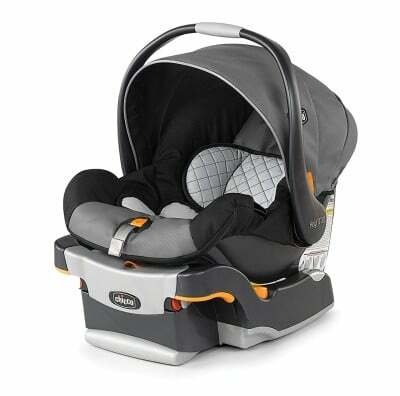 Bravo gives you an option of attaching infant car seat to the toddler seat. 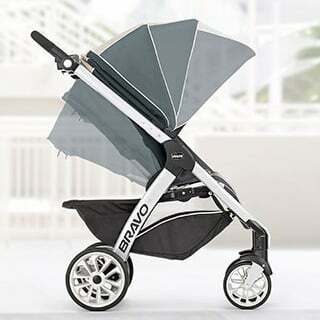 You can also use the stroller canopy which, together with the car seat canopy, provides full protection for the baby. Now let’s take a closer look at KeyFit 30 Infant Car Seat and make sure it has proper features to provide safe ride and strolling. First of all, the base is easy to install in the car. The ReclineSure leveling foot and RideRight bubble level-indicators will help you achieve the right angle. The shell is lined with EPS energy-absorbing foam which protects baby during a collision. This infant car seat is equipped with 5-point harness and newborn insert that supports little baby’s head and spine. It can be easily removed when the child gets bigger. Thanks to lightweight construction (only 9.5 lbs) and ergonomic handle this infant car seat is easy to carry around. Many parents mention in their reviews on Amazon that this car seat is really stable in the base and it is not only safe, but also very comfy for the baby. However, there is one major flaw – few parents wrote on Amazon that the car seat canopy doesn’t always lock in placed properly and some of them doesn’t use it at all (or use only the stroller canopy). When the baby gets older (can sit up unassisted and has enough neck and head control) you can start using stroller regular seat. Toddler seat has 3-position recline and can accommodate passenger up to 50 lbs. To recline the seat we just have to push one button, it can be done with one hand. The seat and leg rest have nice and soft padding, however the latter one is not adjustable. The seat is made of a soft and nice to the touch fabric. It has a five-point harness that provides baby with safety ride. Three of five straps are padded. Shoulder strap height is adjustable, but the crotch strap has only one position. The buckle is places in the middle and the release button is rather easy to use. Remember that Bravo’s seat doesn’t recline to fully flat position therefore it is not suitable for newborns and children without proper head and neck control. When the baby is small you should use Chicco Bravo Stroller with infant car seat and then switch to toddler seat. You can see on a video below how to switch between different seating options. Psst! 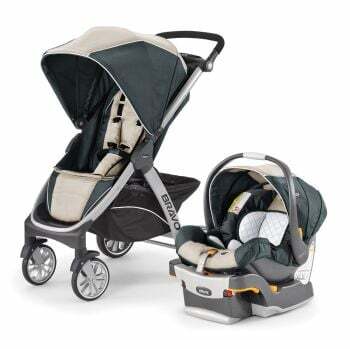 Chicco Bravo Stroller and KeyFit30 Infant Car Seat can be bought separately or as a set. The price may vary, especially if there is a sale. Before you make your decision check the current price and available discounts for each product: Chicco Bravo Stroller, KeyFit30 Infant Car Seat and Chicco Bravo Trio Travel System. This sunshade is also equipped with a mesh peek-a-boo window so you can check on your little adventurer during stroll. This is very useful feature because Bravo doesn’t offer reversible seat and your passenger can only face surroundings. It is nice to have the ability to keep an eye on the baby the whole time. This mesh window also provides extra air-flow. Chicco Bravo is equipped with adjustable handlebar which is very convenient feature for parents of different height. This handlebar offers three different positions so you could find the most comfortable position for you. However, the handlebar heights are convenient rather for short and average parents, but they may be to low for very tall person. There’s one more thing worth mentioning. The push-bar is padded with soft foam. It’s really nice to the touch, but it’s also easy to tear, especially when you use the stand fold very often. This stroller offers linked rear brakes (single-action). They are easy to set and release, even when you wear sandals. There is no color indicator that informs parents whether the brake is set properly so you actually need to wiggle the stroller a little bit to make sure the brake is engaged. Bravo has two 7” front wheels and two 9” rear wheels. They are made of plastic and filled with foam. This stroller is also equipped with four-wheel suspension which absorbs shocks. I’d only wish this suspension was adjustable because it would provide even more comfortable ride. Although the ride is a little bit cushioned, the wheels are not suitable for bumpy, rough terrain. Chicco Bravo Trio underseat basket is quite big and spacious, you shouldn’t have any problems with fitting large diaper bag. It also offers easy access from the back. The storage bin is really spacious and can accommodate all of your necessities for a day trip! 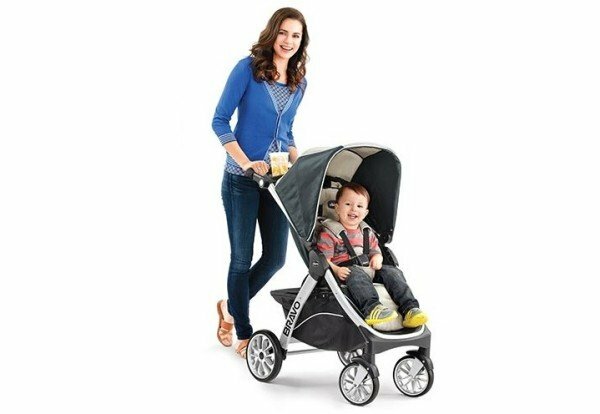 According to many parents this baby stroller is very lightweight (it weighs only 23 lbs) which makes it easy to lift to the car trunk or carry up and down the stairs. Folding is a breeze. You can collapse the stroller with one hand. You just need to grab a handle (placed on the seat) and pull it up. After folding this buggy can stand on its own and it’s pretty compact and small which is very useful when we want to storage or transport it. 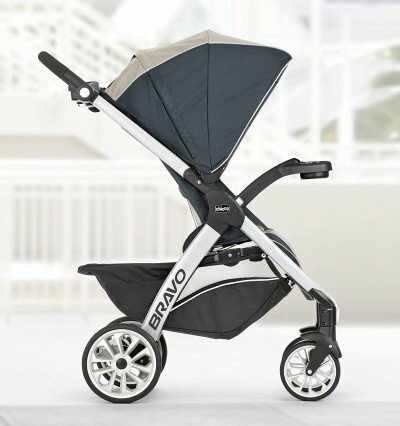 Bravo has one more advantage: when we fold the stroller, front wheels automatically rotate inward and make it even more compact. Chicco Bravo Trio Travel System is really well-made and built from high-quality, durable materials. Thanks to that this travel system can serve parents for years. I’ve read many reviews written by other parents and many of them use it for over 2 years and praise it quality and strength. Chicco Bravo Trio comes with a convenient parent tray and two cup holders. The tray has a little storage between cup holders. You can put there your phone or keys to keep them within reach. 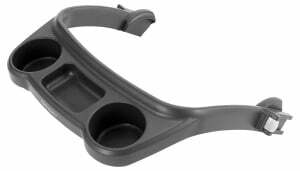 Cup holders can fit a small battle of water, sippy cup or baby bottle. Thanks to this tray parents can have all their belongings at hand. 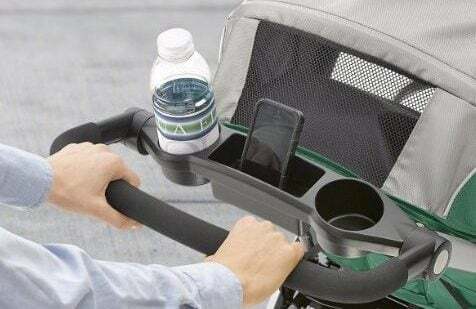 Having parent tray included in the price is a big advantage of this stroller. Most of the strollers don’t come with this accessory and often we have to buy it separately. There is one more useful accessory that you can add to your Chicco Bravo Trio – child tray with a snack storage and two beverage holders. In my opinion, this is a must have, especially if you and your little one are fans of longer strolls. This tray is sold separately, but is doesn’t cost much. You can check the price here. Chicco Bravo is pretty difficult to push and turn with one hand, sometimes maneuvering over bumpy terrain is hard. It is easier to navigate this stroller over even ground and to push with two hands, instead of one. However, in few reviews parents mention that they have taken this stroller over cracked pavement and even dirt roads and it has worked fine. This buggy is pretty small and narrow so it can fit through tight spaces, which I think is a big plus. Moreover, it turns on a dime! Thanks to sturdy frame and a little bit cushioned ride your baby will have comfortable place for naps on-the-go. This travel system is very easy and convenient to use thanks to many nice features like a large underseat basket, parent tray with cup holders, adjustable handlebar and one-hand fold. It offers 3 modes of use: as KeyFit 30 carrier, travel system and stroller for toddler. To sum up I put the most important information in the table below to show you what are the main advantages and disadvantages of Chico Bravo Trio Travel System. I’ve read hundreds reviews of this travel system written by other parents. At the time I’m writing this, it has over 240 reviews on Amazon (and over 200 positive ones). It’s one of the most popular and highly-rated travel systems on the market! Parents praise it for lightweight and compact construction, one-hand folding, adjustable handlebar, durable fabrics, easy to attach and high-quality infant car seat. According to many customers this travel system’s features and overall performance is even better than more pricey strollers’! Few parents (4 – last time I checked) complained that after a while the wheels started to squeak. 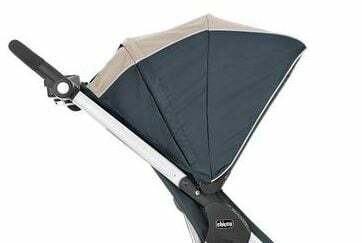 Some parents also don’t like the car seat canopy as it is rather small and difficult to use. This travel system comes in 10 color versions: Avena, Lilla, Papyrus, Orion, Champagne, Poetic, Indigo, Iceland, Blackberry and Lake. The choice is really vast! Keep in mind that the availability and stroller price may depend on the color version you choose. 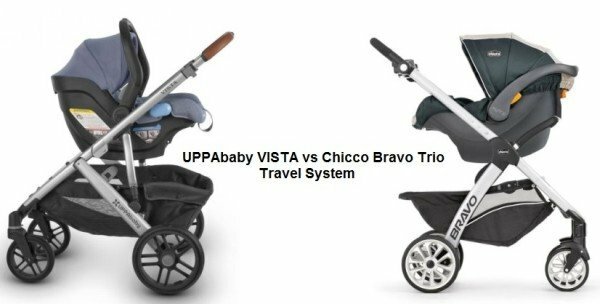 I decided to compare two excellent travel systems and show you similarities and differences between Chicco Bravo Trio and UPPAbaby VISTA travel system. Are you deciding between UPPAbaby CRUZ and Chicco Bravo? 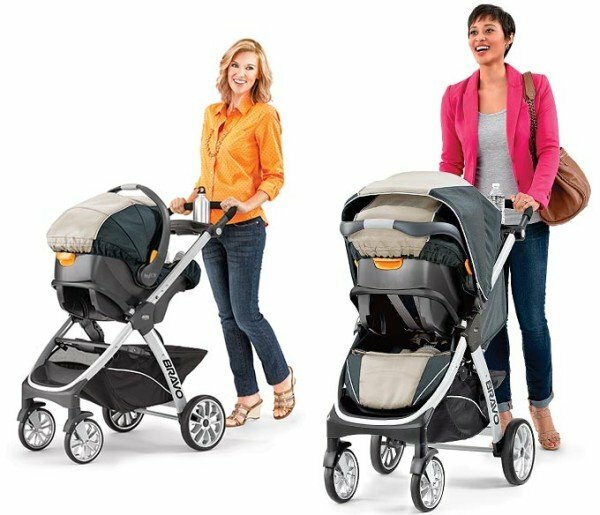 Here is my list of the main similarities and differences between these two strollers. If you want to read more about UPPAbaby CRUZ here is my review of this stroller. Weight: Chicco Bravo Stroller is 1.5 lbs heavier than UPPAbaby CRUZ (23 vs 21.5 lbs). Wheels: Both strollers have plastic wheels filled with foam (CRUZ has even smaller ones) which work fine only on flat terrain. Suspension: Chicco Bravo has 4-wheel suspension, while UPPAbaby CRUZ doesn’t have typicall suspension, only shock-absorbing tires. Age recommendation: Chicco Bravo Stroller can be used from 6 months, UPPAbaby CRUZ seat is suitable from 3 months or even from birth if you add Infant SnugSeat. Option for the second child: Chicco Bravo can be used only for one baby at a time. CRUZ offers PiggyBack board which attaches to the stroller frame and is suitable for older child that can ride while standing. Leg rest: Chicco Bravo leg rest is not adjustable, while CRUZ’s is adjustable. Handlebar: Chicco Stroller has rotating handlebar, while CRUZ has extendable telescoping handlebar, which gives taller parents more room behind the stroller so they don’t kick it while walking. Canopy: CRUZ’s canopy has SPF 50+ and is bigger than Bravo’s sunshade. Storage basket: CRUZ’s basket has bigger weight capacity than Chicco Bravo bin (25 vs 10 lbs). Price: You can compare the price of CRUZ and Bravo on Amazon. Chicco Bravo Trio Travel System is an amazing solution for parents who want to buy matching set of a stroller and infant car seat. This is great approach if you want to spare space in your home and your budget is tight, but of course you still want a good-quality product. Each part of this travel system is well-made and easy to use. You get really great quality for a reasonable price! The stroller has plastic wheels, so they don’t handle many types of terrain (especially harsher terrain). They work fine or rather even surfaces, pavement, flat gravel paths. 1. Chicco Bravo Trio is made of durable materials and will serve you for many years. 2. This is a great all-in-one travel system, perfect for urban parents, especially those who often drive and need a stroller that can be quickly folded and thrown in the trunk. 3. It’s not only a space-saver, but it also has a pocket-friendly price. It’s perfect choice for parents on a small budget. 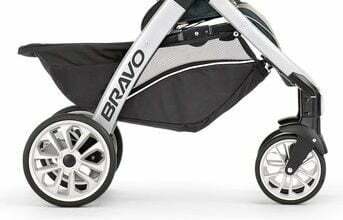 Do you like Chicco Bravo Trio Travel System? Before you purchase it, make sure to check available discounts and other parents reviews on Amazon.